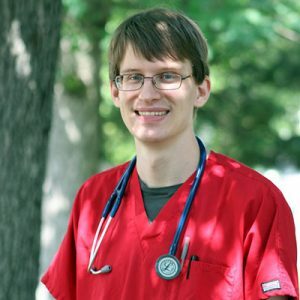 Dr. Matt graduated from Drew University in Madison NJ, with a BA in biology and a minor in biochemistry. Matt has been with HousePaws since he earned his DVM in 2014, from the Virginia-Maryland Regional College of Veterinary Medicine. Matt grew up in nearby Haddonfield New Jersey, where his family owned and operated the Three Beans Coffee Company. Matt can’t remember a time when he didn’t want to be a veterinarian. He has spent his whole life around animals; growing up among numerous dogs, cats, pocket pets, horses, and reptiles; working at local veterinary hospitals during his summers; working at Camp BowWow Cherry Hill as a Camp Counselor prior to Vet School; and collecting numerous strays over the years. After 4 years of veterinary school in Virginia, Matt was thrilled to return to New Jersey and join the HousePaws team. He is extremely grateful to be working with such a unique and dedicated team of veterinary professionals. As a newer vet, Matt is still developing his professional interests, but over the last few years he has gained extensive experience in surgery, and also enjoys teaching and public education. Matt especially enjoys working with the community and Vets in Training program to help promote pet health and veterinary medicine as a career. Matt resides in his hometown of Haddonfield with his wife Jen, a gifted artist with a talent for painting and drawing animal portraits. They share their home with their dogs Luna and Dale and their two cats Pepper and Hemy. Matt is an avid gamer and loves puzzles, board games, video games, and riddles.